Nodessert | Just good food. Pls go to http://nodesserts.blogspot.com/ for my new updated blog!!! 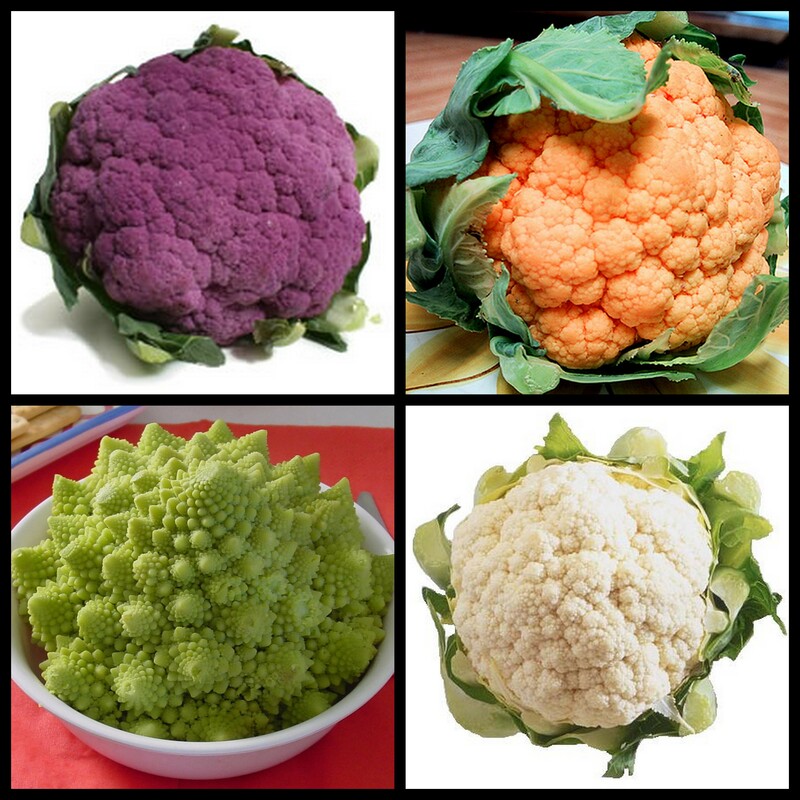 The cauliflower is not a favourite vegetable among most of my friends. Except perhaps when it is coated in a spicy chilli-flavoured batter and deep-fried. Anything deep-fried is nice, after all. But on the rare occasion when there is a when there is a cauliflower on the table, I find myself the only one excited. What’s not to love? Crunchy or soft, the cauliflower is truly adaptable. Honest. It’s wonderful in a curry/masala as it absorbs the flavours well. As mentioned above, its delicious when deep-fried (after dousing it in boiling water to soften it a little). It’s nice au Gratin too. I even like it steamed (with broccoli and corn) and seasoned with just salt and pepper. But what I really like is mashed-roasted cauliflower! It’s way better (and healthier) than mashed potatoes – yes, even better than the Colonel’s mash. I decided to test out my theory (that mashed cauliflower beats mashed potato) on some cauliflower hating friends. I didn’t reveal the main ingredient of the dish as, all mashed up, it kinda looked like potatoes anyway. No Andy Warhol magic needed. Here’s what I did. First, I steamed the cauliflower till it was nice and soft — about 20 mins. Then, I mashed it with a fork. Easy. Preheated my oven to 180C. Next, in a small pan I melted some butter and sautéed some garlic, minced fine. I added the mashed cauliflower and added about 1/4 cup milk (or cream if you prefer). I let the mixture simmer (low heat) till there was no more liquid and then I added about 1/2 cup cheddar. I then seasoned it with salt and pepper. As the cheddar was pretty strong, I didn’t need that much salt. After about 2-3 minutes, I transferred the mash into a bake-safe dish, sprinkled some cheese on top and let it bake in the oven for about 10-15 mins or till the top began to get golden. Remove, scoop out, garnish with coriander and serve. OK, the results. My unsuspecting dinner guests loved the mash but they also kinda guessed it wasn’t mashed potatoes. They were not able to guess what it was though. 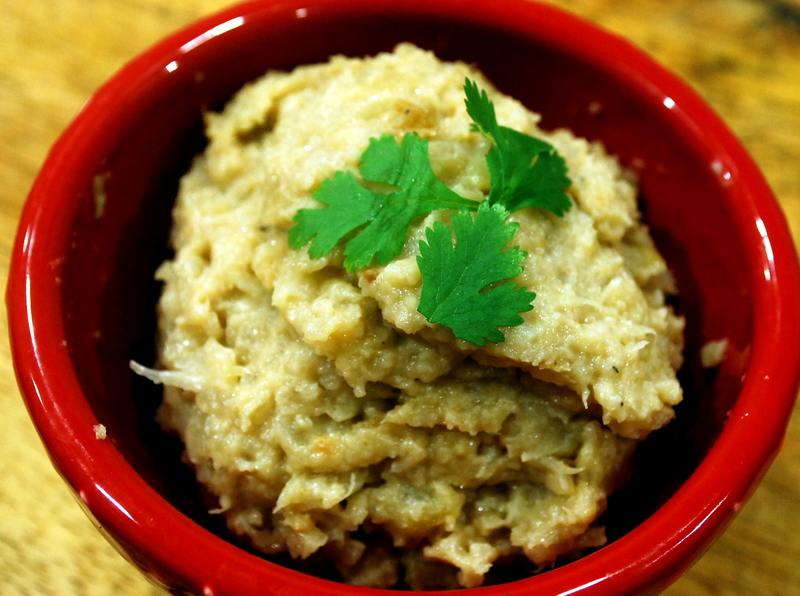 the nuttiness of the boiled and then roasted cauliflower kinda made them think they were eating mashed beans — they weren’t too thrilled at this thought. When I revealed what it was, there was silence. No, they didn’t become cauliflower converts but admitted that they wouldn’t mind seconds of my mash. I’d call it a success. After all, they ate so much I had to chance to help myself to seconds! Backfired? Perhaps! I love soft, flavourful breads. All breads are flavourful, you may argue. Well, most home-made breads are indeed flavourful but I find that store-bought breads are mostly pretty bland and have no character (I am talking about the loafs that are pre-packed and have a 2-week shelf life!). Since I successfully baked my first loaf about seven months ago, I think I’ve eaten store-bought bread less than five times. Why buy when you can bake, right? Sure, baking takes time (unless you have a bread machine — but where’s the fun in that?). Also, baking my own bread means I can add any herb/nut/grain/seasoning I like depending on my mood. Now that’s really swell especially since I love herb buns and they’re not that easily available in stores. So, anyway. I was in the mood for some bread making and was mentally going through a list of breads I could possibly make. What about Pretzels? 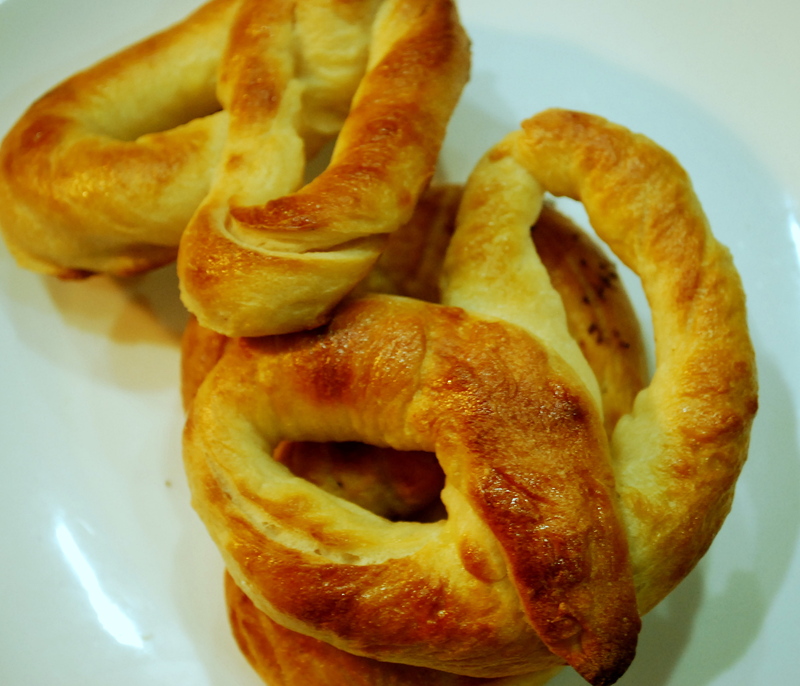 I’ve never made them before even though I’ve read quite a few recipes and articles about making a good pretzel. Why not? I was feeling relaxed (a four-day weekend would get anyone to relax, right) and adventurous. So, why not? Usually whenever I get a craving for pretzels (not very often, thankfully) I head over to Auntie Anne’s Pretzels for a sour-cream and onion or cinnamon flavoured knot. I like em. So the question is, could I make mine as nice? I used a recipe I had earlier bookmarked from thefreshloaf.com, a great resource of you like making bread. I intended to make the Laugenbrezel or the Lye Pretzel — a basic pretzel that is first dipped in boiling water+ a drop of Lye and then baked. The recipe on thefreshloaf however skips the lye bath, deeming it unnecessary for homemade pretzels. Ok, great. Am all for skipping a lye bath for it kind of reminds me of a tic bath I have to administer on my dog, Mojo, from time to time. Urrgh. Combine all the ingredients in the bowl of your electric mixer and mix until the dough forms a ball. Use 2 cups of flour first and add more, if necessary. I used a little less than 21/2 cups. Mix it for about five mins on low speed (speed 2 on my Kenwood) and then anpther 5-7 mins on 4 until the dough is all smooth and shiny. Remove the dough and form into a ball. Place in a greased bowl, cover with plastic wrap and let it rise till double the size, about an hour. Degas the dough gently and then transfer onto a work surface. Cut the dough into 6 pieces. Roll each one into a short log, cover with a towel and let the dough relax for 5 to 10 minutes. This makes it easier to roll it out and stretch it. Roll each log into long ropes about as thick as your index finger, 15cm in length. You may have to let it rest as you roll/shape them. 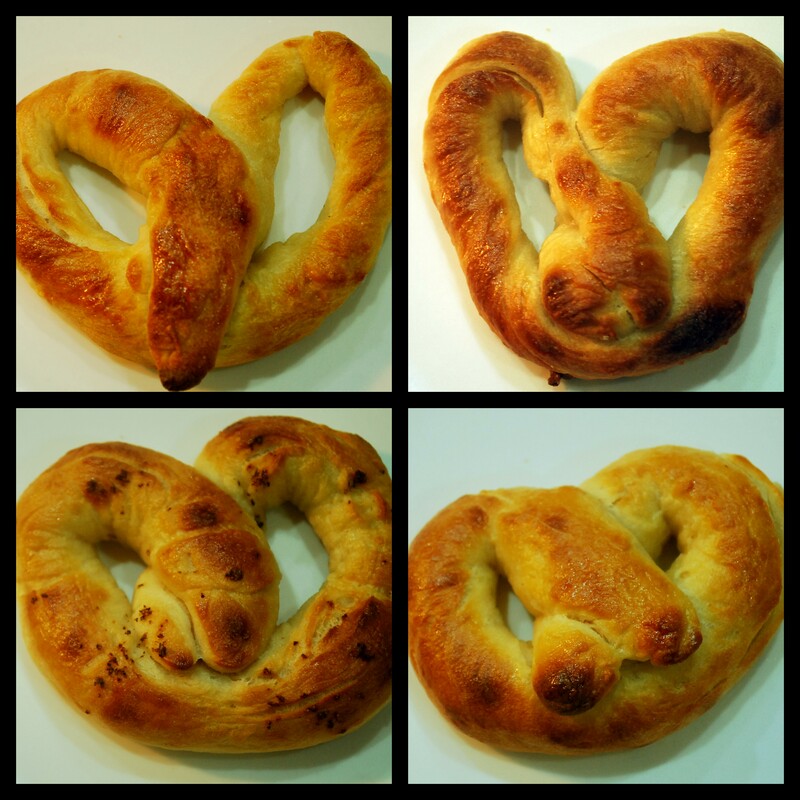 To shape the pretzel, form the dough into a”U”. Cross the ends and cross them again. They fold the crossed ends downwards. Confused? Check out THIS site for guidance. Once all 6 have been shaped, bring a saucepan of water to boil. Now, using either two metal spatulas or a big wire strainer (the kind you use to deep fry stuff) dip each pretzel in the boiling water (one by one) for about 10 seconds. Drain and place on a baking sheet. Brush each one with egg wash and sprinkle with salt and any topping of your choice: poppy seed, sesame seeds, nuts, onion powder, grated parmesan, etc. Bake for about 15 mins or till nice and golden. Still on a Japanese food bend, I tried to recreate a delicious dip I had in a Japanese fusion restaurant called Shokan in Tokyo. Served with a selection of raw vegetables, the dip was so good. 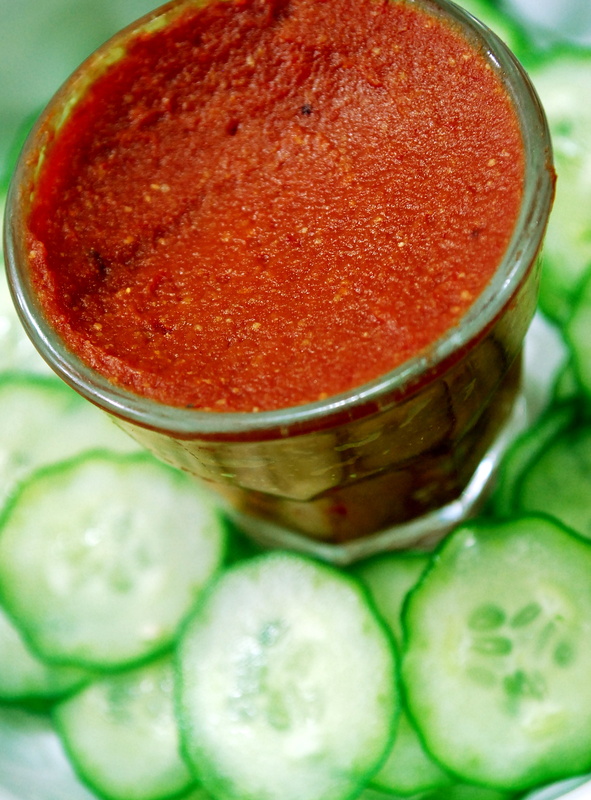 The earthiness of the miso blended well with the freshness of the tomato paste; the saltiness of the miso went so well with the sweetish tomato paste. It was a marriage waiting to happen. I tried to get the recipe for the dip from the owner /head chef of the restaurant — a friendly guy who knew just enough English to converse with us — but he subtly evaded my prodding again and again. The dip was his own concoction and I guess he wasn’t going to pass it out to just anyone. First, I had to determine the right ratio between the tomato paste and miso. 2:1 was what I settled upon. 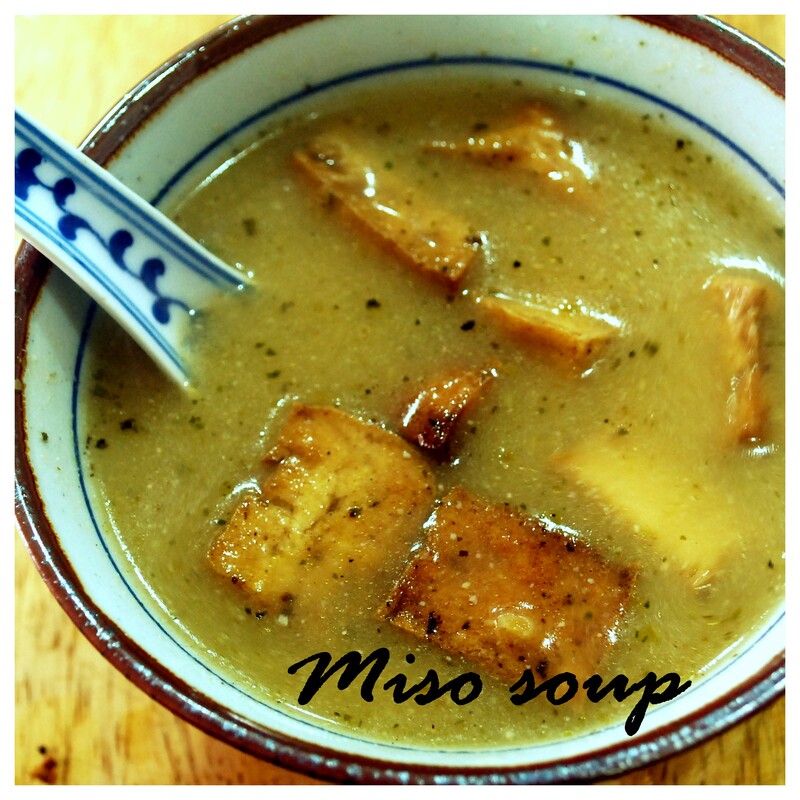 (You may have to set your own ratio depending on the type of miso you use and how strong it is). What else should I use? The tomato and miso alone tasted yummy but there was still something missing. It wasn’t the same as the one I had at Shokan. I tried adding a few different ingredients: minced ginger (not bad), pepper (not great), vinegar (just a bit is actually quite nice), japanese mayonnaise (oh, so yum: with less tomato paste). Ok, so I may not have cracked the code and replicated the dip at Shokan exactly but who cares? I still have a very tasty miso sip … actually I have several and that’s good enough for me. WHY do some recipes work and others don’t? Have you ever followed a recipe, word for word, step by step only to fail? Well, that’s my puzzle this week. 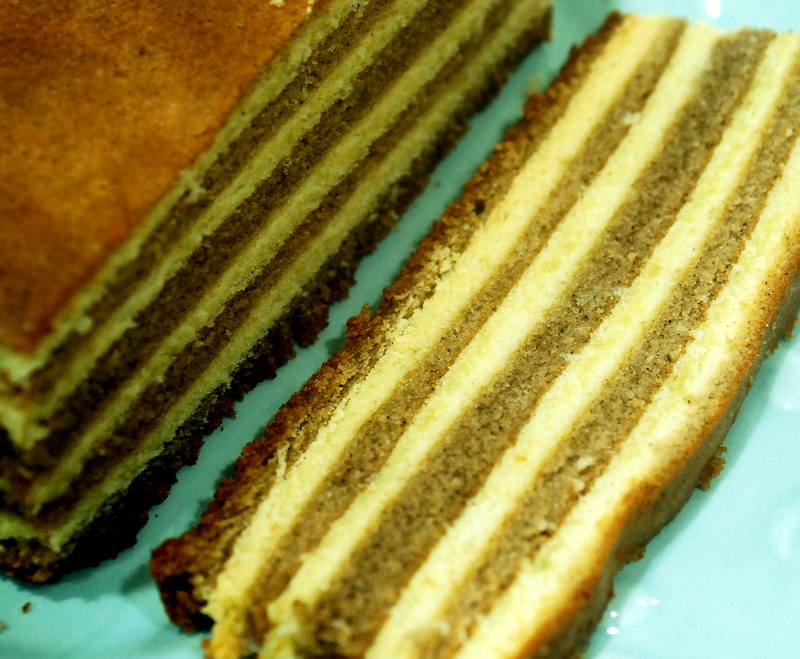 I decided to make Spekkoek, or the famous Indonesian layer cake as it is one of my favourite cakes. After browsing through several recipes online, looking through the ingredients and the instructions, I concluded that it wasn’t too difficult to execute. Sure, it called for a lot of time and patience — it isn’t called “thousand layer cake” for nothing. Though way less than a thousand, the cake has many thin layers (about 40) that have to be grilled one by one. Each layer is about 1mm thick, no more. But, apart from having to spend a couple of hours literally in front of the oven, the cake seemed simple enough to make. True? OF COURSE NOT. Making Spekkoek proved to be one of the most frustrating experiences I’ve had in the kitchen. I had to make this cake five times before it turned out decent. Five times! Ordinarily, I would have given up after attempt No. 3 but I was making it for this month’s Don’t Call Me Chef column (which comes out today) so I had no choice but to complete it. I must have gone through at least a dozen different recipes for Spekkoek. I studied each one, wondering why my cakes looked nothing like the Spekkoek you buy in the shops. The taste was pretty similar but that was as close as I seemed to be getting. With the Spekkoek, looks matter you see. I followed the recipes to a T and yet my cakes were dry, my layers too chunky. I didn’t get the fine brown layer. I couldn’t get moisture in the cake. Nothing seemed to work. ARRRRRRRGH. Finally, after five attempts I baked a cake that looked authentic. My cake was still not moist enough. It wasn’t dry but if you’ve tasted a good Spekkoek, you’ll know that it is really quite moist and very rich. My Spekkoek was nice and fragrant and tasty too but, darn it, it still was nothing like the Spekkoek I look forward to eating at my friends’ houses every Raya. I don’t think I will be making any more Spekkoeks anytime soon but I did learn a few things in the process which will, hopefully, make me a better baker. Still, I was proud of my Spekkoek. I learnt some valuable lessons making the cake and this is what I want to share. 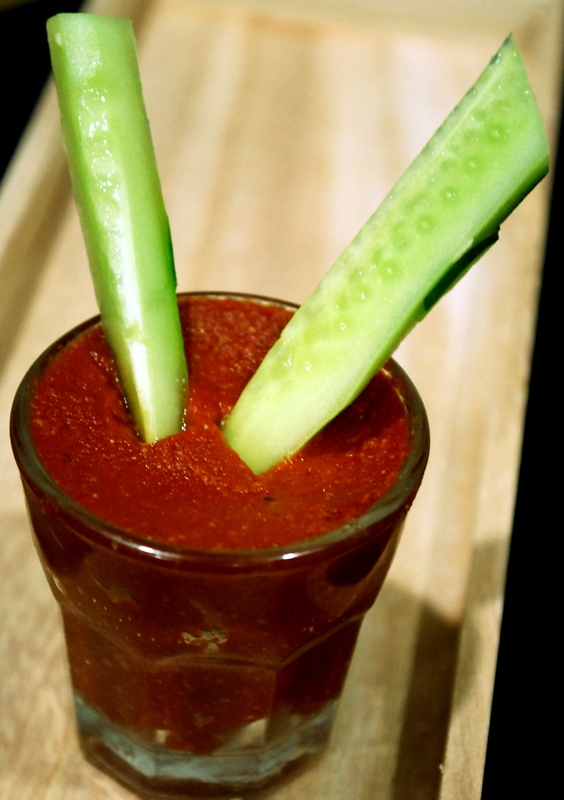 (For the recipe per se, you can read the column here). Some of the lessons I learnt may seem pretty obvious (to me esp, on hindsight) so, bear with me. 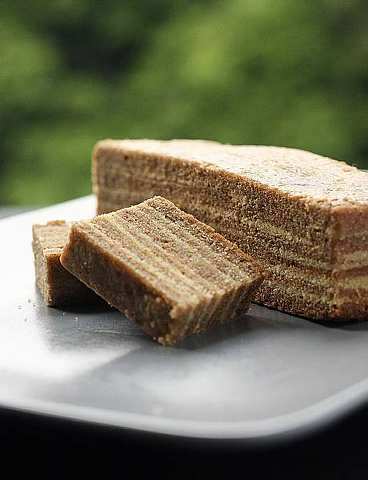 LESSON 1: The layers in the Spekkoek may look like interlying layers of two different types of batter (one light, one dark; one spiced one not) but THEY AREN’T! The first recipe I tried, had me alternating between a plain butter batter and a spiced batter (Pic, top left). Maybe this is another version of the cake but the authentic cake calles of layering just ONE BATTER over and over. 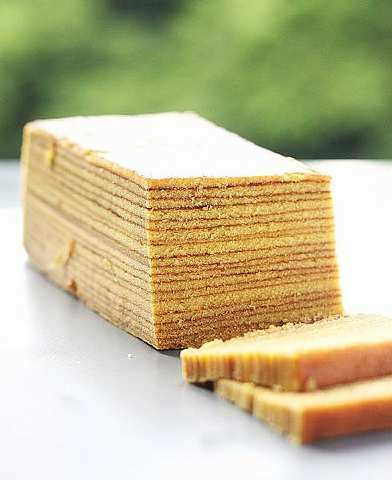 The brown layer you see in the cake is because the cake is GRILLED, so the top of the cake browns while the rest remains pale. Its not two different batters, lah! 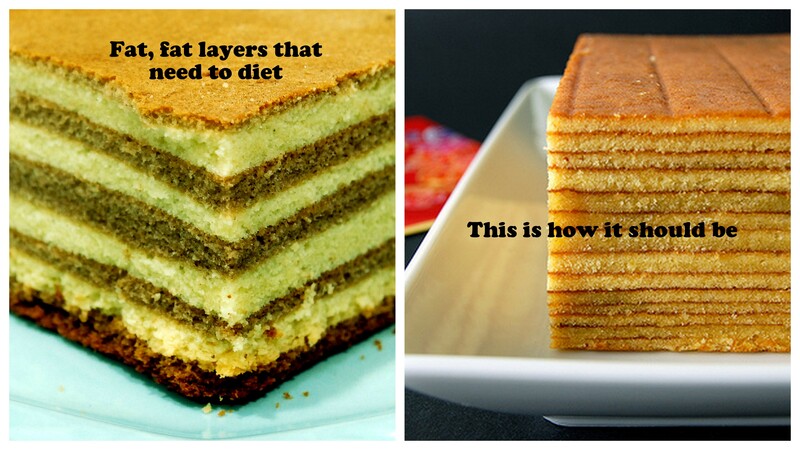 LESSON 2: Spread the layers really thin. About four tabelspoons per layer in a 6 inch X 6 inch pan may seem too little but believe me, it’s being generous. For my first attempt I decided to double the amount. The result? See the pic above. The batter rises. LESSON 3: The recipe requires you to separate the egg whites from the yolks. Some recipes use only the yolks, some use both the yolks and the whites (though always more yolks than whites). Some require you to whip the whites to a meringue. My conclusion: use yolks only. If you want to use a couple of egg whites, DO NOT whip them too much or your cake will be too airy, too dry. I don’t know if my conclusion is right though. Would appreciate some feedback. Please? LESSON 4: Grill NOT bake. This was my mistake. All the recipes call for the cake to be GRILLED. The first time I made it however, I somehow didn’t register that command and so I BAKED the cake. The result? No browning of the top and so, no distinct brown layer (See pic below). Also, I forgot that to grill in the oven, I’d have to shift my rack right to the top. DUH! LESSON 5: The recipes uses a lot of butter, presumably to make the cake nice and moist. Butter alone didn’t work for me. I even substituted oil for butter a couple of times. Still, I couldn’t get a moist enough cake. My last recipe used condensed milk + icing instead of granulated sugar and that worked better. Suggestions, anyone? Ahhhh, Japan. I just got back from a week-long trip to Tokyo, Japan and I was blown away. What’s to love? The food, the beautiful people, the buzz, the 99 Yen stores, lemonade Kit Kats (? ), … twas hard to come back. Despite knowing only ten Japanese words/phrases — Hai (yes), Konichiwa (hello) , Domo Arigato (thank you), Sayonara (good bye), Sumimasen (excuse me), Gomen-nasai (Sorry), Tasukete! (help), Ohayō gozaimass (Good morning), Wakarimasen (I don;t understand) and ikura desu ka? (How much is that) — I had minimal problems getting around the city, ordering food, shopping or taking the trains. Sure, I got lost a couple of times … in a cab! The cabbie didn’t understand me and I don’t blame him but it was all good in the end and with sign language and a lot of smiles, I was able to get where I wanted anyways. I’ve been to Tokyo just once before, a couple of years ago. It was a busy working trip though and I had hardly enough time to explore the city. This time around, I was luckier. Though I has quite a few events to attend and five interviews to conduct (work really does get in the way of fun! ), my schedule still allowed me two full days to explore the city. Also, since my travel buddies were night owls, I was out gallivanting in the city till way past midnight most night. 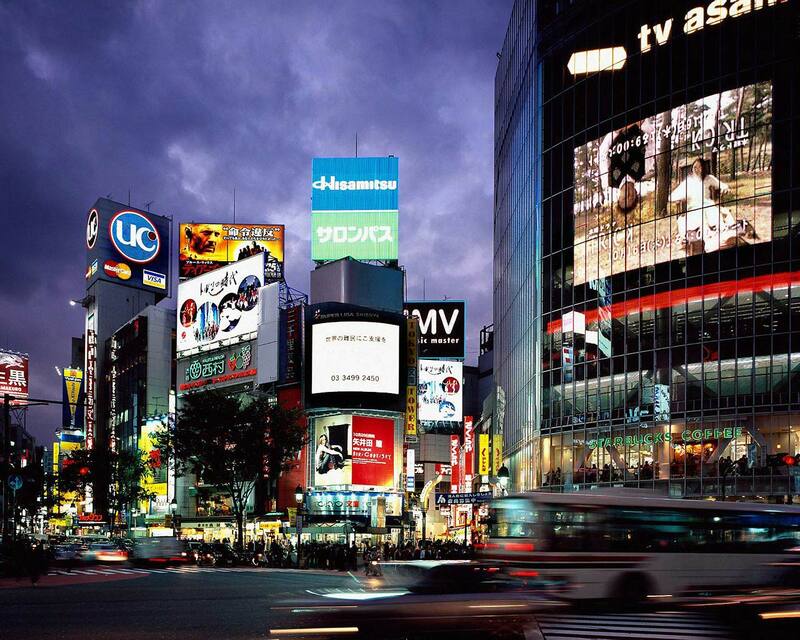 Tokyo can seriously challenge the Big Apple for the “city that never sleeps” title! I was also blessed because my two buddies, Shirley and Zoey, were rel foodies. Hard-core foodies who kinda made me throw my diet out the window. Aww, you’re in Japan. Plus they have a gazillion instant diet pills that you can pop as you eat, they said. I was easily convinced. I had resigned myself to eating mainly tempura, miso soup, soba and edamame throughout my trip. The Japanese are serious carnivores and although there are a number of vegetarian Japanese dishes, asking for a purely vegetarian dish (no bonito flakes, no pork or beef stock, etc) via sign language was just impossible. So, yeah, I had low expectations on the food spectrum. Turned out, I was wrong. Yeah I had tempura (vegetables which are deep-fried in a batter – oh, my, it was delicious), miso soup (you can’t ever go wrong here, yummmm) and edamame (to go with Kirin, way better than beer nuts!) but I also had some yakitori, vegetarian Onigiri (rice cakes), the most delicious grilled and chilled sesame-seed tofu served with grilled tomatoes … and more. We ate everywhere, from small basement (literally) Japanese restaurants to road-side stalls to really fancy five-star style restaurants. Remember the movie Kill Bill? Remember the Uma Thurman’s swashbuckling scene at the japanese rest (PIC above) ? Well the set was inspired by an actual restaurant in Roponggi, Tokyo called Gonpachi and we went there despite mixed reviews about the food. It was AWESOME. (pics will be up later). So anyway, to cut a loooooong story short, I am so in love with Japanese food now that I have been craving nothing but since coming back. Let’s start with the basics while I practice my sushi/onigiri skills. It’s coming… I promise. Yesterday, I had a super healthy, detox Japanese dinner: edamame for starters and miso soup + tofu as my main (with some cold soba on the side). Yummmmm. Bring stock to a simmer and add the seaweed. Allow to simmer for about 5 mins (low heat). Add the tofu, soy sauce and sesame oil and continue to simmer. Ladle out some of the simmering stock to dissolve the miso paste and then add it in the pot with the tofu. When it comes to a boil, remove and serve. 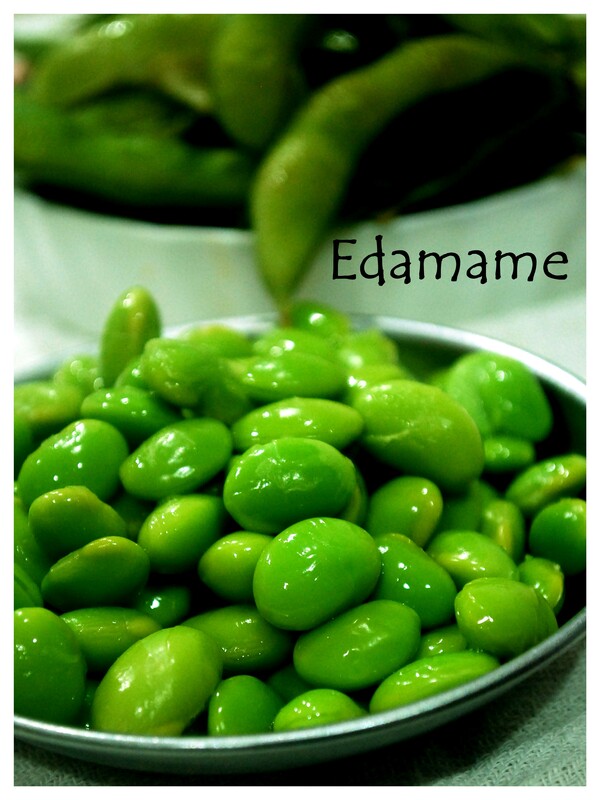 To prepare the edamame, just boil in salted water for about 10 min or steam and season with salt and pepper. I added some red chilli flakes (bought in Japan for authenticity). Thanks, Williams-Sonoma, you really done me in! I haven’t cooked rice on the stove top for … 20 years! Yup, my Panasonic electric rice cooker cooks my rice for me. Even when I make nasi briyani, it’s in the rice cooker. My friend, the rice cooker. As absent-minded as I am, the rice cooker is an absolute, absolute necessity. Why? Well, back when I had no rice cooker, it was quite a common that my neighbors would hear a high-pitched screech around-about lunchtime. Why? Well, I’d put the rice on the stove and then I’d get bored. Who wants to watch a pot of rice cook? So, I’d multi task. I’d start on the laundry or get on the computer or plant myself in front of the TV (this was most often the case) and forget all about the rice that’s on slow boil in the kitchen. Until I smelt the burning. Acck. Have you ever smelt burning rice ? It’s god-awful. By the time the smell wafted through the house to reach me, the rice would be long gone. Almost charcoal. Unsalvageable. I’d have to throw it out with clothes peg on my nose (ok I am exaggerating but it smells awful). Naturally, I’d have to cook a second batch and this time, to avoid a repeat performance, I literally would have to watch my rice cook. Lifting the lid ten times too often, mentally hurrying the grains up. So anyway, that’s why I love my rice cooker. You wash the rice, chuck it in the cooker, add water and switch it on. You can then proceed to do any number of things and it won’t burn on you. 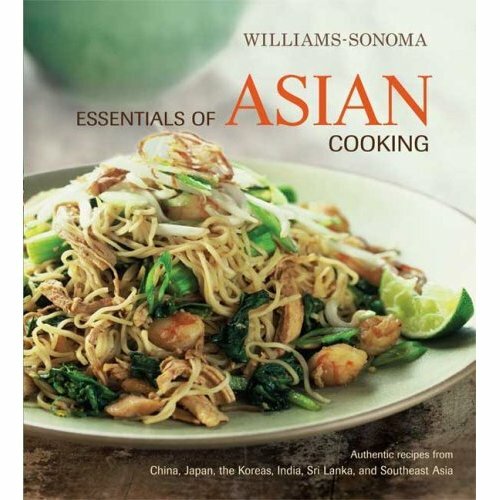 And then I got this book to review: the Williams-Sonoma Essentials of Asian Cooking cookbook (the review will be published tomorrow and I will dutifully add the link then) and I could not resist trying the “Lemon grass and Coconut Jasmine Rice”, evidently a Thailand staple . (The cookbook features recipes from 15 Asian countries: the essentials of each country’s cuisine.) The only problem? The rice had to be cooked on the stove. Grrrrrrrrrrrr. The picture of the rice looked so wonderful that I had to try it, even if it meant digging out my weathered rice pot from the deepest recess of my cupboard. Urrrgh. The recipe was pretty simple. The key is to use a non-stick pan (you don’t want to scrub till the cows come home) AND to toast the rice in oil or some sort of fat (butter/ghee) before adding in the water so that the rice doesn’t stick to the pot and together. Heat the oil in the pan. Add the onions and cook till translucent. Add the rice (washed and drained) and cook, stirring, till the rice is nicely coated with oil and onions — about 3 mins. Add the water, coconut milk and salt and stir. Once it comes to a boil, add the smashed lemon grass and cover the pot. Turn the heat down to low and let the rice cook, undisturbed for 10-15 mins. You can peep in after 10 mins to see how it’s progressing and taste it: you may have to add a little more water. Once it’s done, turn off the heat and gently fluff up the rice and then put the lid back on, letting it steam in the pot fo about 10 mins. You’re good to go. OK, that wasn’t as painful as I though it’d be. 15 minutes isn’t that long a time to hang around waiting for rice to cook. I did the dishes and watched a pair of lizards dance around my ceiling. Fascinating! The result? The rice turned out great. 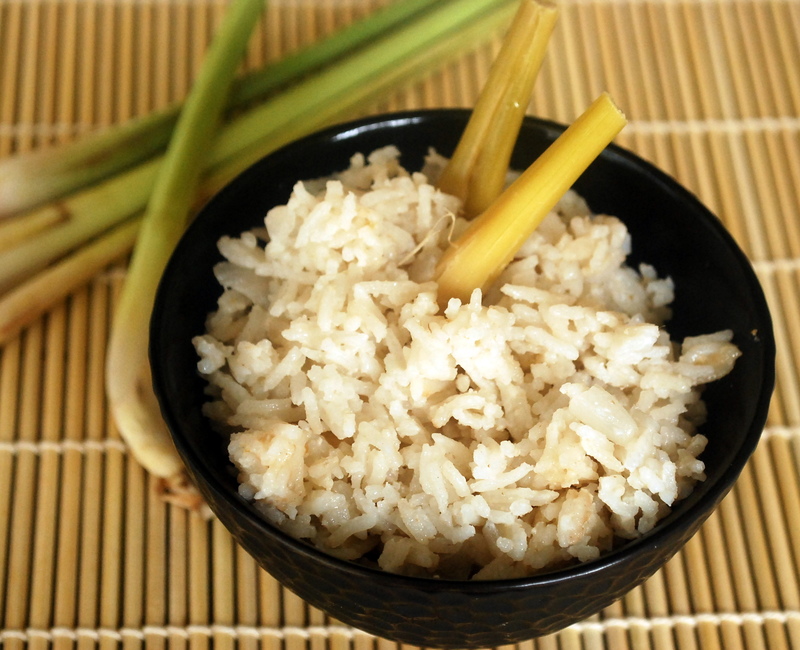 Don’t underestimate the humble lemon grass: it infused an almost citrusy flavour to the rice. Awesome. So, if it turned out great why am I (not) thanking Williams-Sonoma. WELL, the rice was such a hit with the mister (as opposed to missus — geddit) that I may just have to say bye-bye to Mr Panasonic and cook rice ol’ skool style. I either have to establish a friendship with them lizards (urrgh) or warn my neighbours not to call the cops if they hear me screaming just around noon.